In a bowl mix together tapenade, goat or cream cheese, and pinch of salt until thorougly combined. Stuff each mushroom cap with the mixture…not packed too tightly. Bake at 350 for approximately 25-30 minutes until golden. 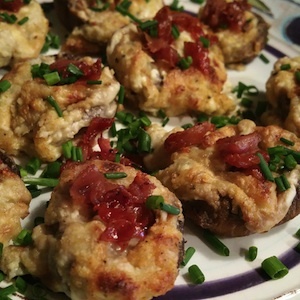 When mushrooms are done baking sprinkle with prosciutto bits, chives, and drizzle with White Truffle Olive Oil. Many of our tapenades would be great in this recipe…be creative!